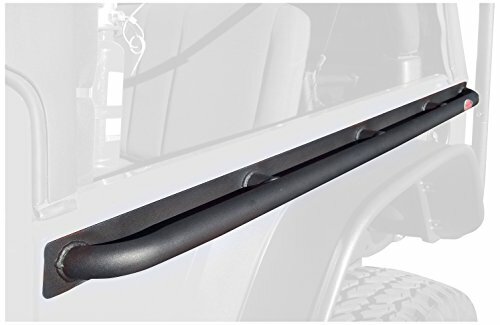 The tub rail from Body Armor is the first bolt-on rail that is designed to protect the Jeep’s tub from trail damage. You can now lean your Jeep against a tree or rock without having the fear of tearing up the body of the Jeep. Designed to match the look of the Body Armor rock crawler side bars. Sheet metal back plate with 1.75 inch diameter 3 millimeter wall tube welded on for strength. Available in black textured power coat, simple installation, drilling is required (standard TJ).